Born: December 27th 1974 in Paris, France. Chrystele was a university student discovered at a casting call for a Benetton campaign, an open casting she almost didn't show up for because she thought her signature frizzy hair looked a mess. A wild, free, untamed head of hair! NEW YORK (CNN) -- Chrystele St. Augustin admits that when she let her hair down, it made big fashion news. But this blue-eyed, 22-year-old French model says she's always wanted to be on the other side of the camera, reporting the news. Less than two years ago Chrystele was at school studying journalism. Back then, she said, she always kept her hair tied back. When she finally let it down, she was discovered by a photographer. Now, she is well on her way to becoming a super model, and is about to conquer New York. "I was a student looking for a job, then I did a commercial for Benneton and the casting director asked me if I wanted to join an agency," she said. "I wanted to be a journalist, but I wanted to show positive things, because usually in news you usually get bad things. I wanted to show positive things on the way all the people live." While she has an interest in reporting, she doesn't always enjoy being the focus of the fashion media. "I must say that sometimes it is a bit annoying because you are doing things and you have to answer the question while you have to do other things, you know. And sometimes the questions are really always the same, and you get bored after a while." Questions about her hair rank high on her list of "boring questions." But it is her hair that has made her distinctive as a model. "People from fashion make me discover beauty in myself that I didn't know," she said. "They make me discover that wearing my hair open is great and beautiful." In school, her hair would block her classmates' view of the teacher unless she tied it back. Now, photographer Ruven Afanador said, "She's an exception in her beauty. There's really nobody that has this kind of look, this kind of features, and this type of hair. The whole combination." Chrystele is five feet 10 and a half inches tall. Her parents are from the Caribbean island of Martinique, but Chrystele was born and raised in France. She lives with her mother just outside Paris, but says she's also having fun discovering New York -- she always wanted to travel as a student. "I really like New York at seven in the morning, when there is nobody and just when the sun is coming on the skyscrapers," she said. "I like downtown, Soho. I think it is really lively. It looks like a little village, and I really love it." She wants to stay in fashion only as long as she can feel useful and feel that she is still growing professionally. If her modeling career ends, she would consider going back to journalism. "I've got a lot of things I can do," she said. "There are so many things in the world you can do." Model Chrystele is happy to be nappy. Three years ago she went au naturel after years of doing the chemical thing. "I thought the straight hair was really ugly, and I hated it," she says in her thick French accent. "I think it suits the white girls, but it doesn't suit my hair." And she was right. In fact, the 22-year-old Chrystele has caused quite a stir in Fashion Land with that hair. Last year, while still a communications student, she tagged along with a friend to an open casting in Paris for a Benetton ad. After getting the job, she went straight to the runway. 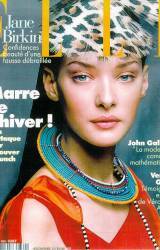 There she was, in the middle of Paris's fall '94 collections, with only one week of modeling experience under her Afro. "I was feeling like I was from another planet," Chrystele says, laughing. "Everybody wanted to touch me, and I'm, like, `Wow, it's just hair. Calm down!' "
Because of her striking looks, many are quick to assume she's of mixed parentage, but Chrystele is obviously bothered by the suggestion. "It's completely wrong. My parents are both from Caribbean islands. My dad is from Martinique and my mom from Guadeloupe," she huffs. "They're both black, and that's it. I am black girl." Chrystele is in the Woody Allen film, Celebrity. She has a very small role as Melanie Griffith's character's make up person/assistant She's only on camera for a couple of seconds really, but it was a fun surprise to see her. I think she did deserve a credit though, which she didn't get.